NEW DEVELOPMENT - The Daisy is an elegant, spacious and versatile property that is a perfect fit for established and growing families. The living/dining area provides a delightful family space and it's also perfectly suited to hosting special guests. Downstairs also offers an attractively sized kitchen and the convenience of a downstairs cloakroom. Upstairs there are three impressively sized bedrooms and a spacious family bathroom. The master bedroom also features a built in wardrobe with outward opening doors which give you all the space you need. Gardens to the rear and front with driveway. Directions - Leave the A5 at Whittington roundabout onto the A495. Continue 400 metres and turn left onto Burma Road passing New Saints Football Club/The Venue on the right, then continue onto North Drive. Park House Meadows will be found on the right. Location - Park Hall was a medieval manor house built around 1571 on the grounds of Whittington Castle Park with views over the Iron Age hill fort, Hen Dinas. It was one of the most impressive Tudor buildings in the country, but sadly burnt down in 1918. Park Hall still has many of its original Victorian properties and a variety of more modern homes all set in beautiful park-like surroundings. Surrounding Towns & Villages - Whittington is a popular village boasting a number of amenities including: post office, village shop, hairdressers, ancient moated castle, church and two public houses The primary school in Whittington is highly sought after locally. Oswestry is a market town located on the border of England and Wales. Famous for its outside markets on Wednesdays and Saturdays and livestock market, Oswestry is one of the country's oldest recorded border towns. The town centre boasts a mix of independent and high street shops along with specialist retailers and has a number of popular restaurants. Nearby Oswestry showground plays host to a variety of annual fairs, music festivals and the popular, annual Oswestry show. The historic market town of Shrewsbury enjoys their annual Flower Show which is held in the Quarry Park close to the River Severn and the town is a popular with tourists because of its ancient timber framed buildings, some of which date back to the 15th Century, The Abbey and Shrewsbury Castle. The town also offers a wealth of high street shops, independent traders, a theatre and a wide choice of eateries. The Builders - Primoris Homes Ltd - The word 'Primoris' is Latin and means first or foremost, exactly what Primoris Homes are aiming to be is the foremost quality builders of desirable homes in the area. This small family run company have built up an enviable reputation for building attractive developments, which offer contemporary, flexible living spaces to suit the needs of their customers. The build quality of every new Primoris development is of utmost importance to the company who ensure the best materials are used and that quality workmanship and attention to detail are evident throughout. Every new home by Primoris is built to exacting standards and backed by a ten year NHBC warranty. 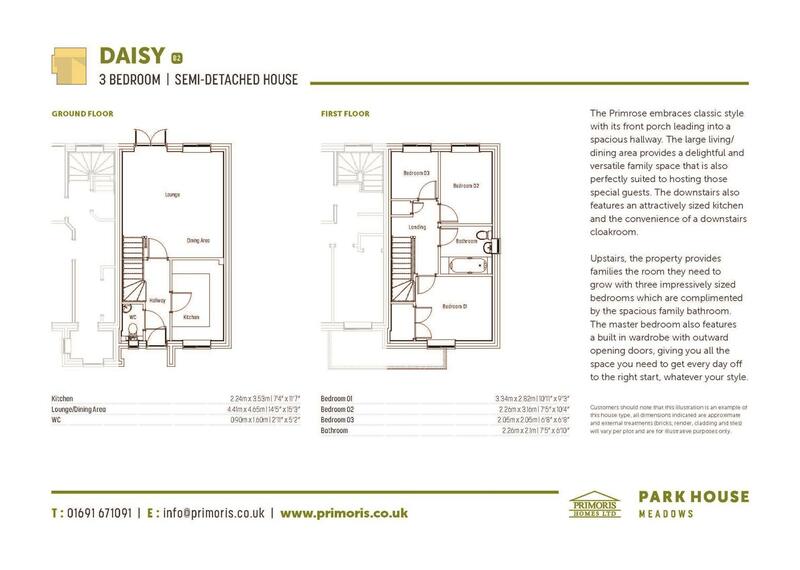 The Daisy - Description - The Daisy is an elegant, spacious and versatile property that is a perfect fit for established and growing families. The living/dining area provides a delightful family space and it's also perfectly suited to hosting special guests. Downstairs also offers an attractively sized kitchen and the convenience of a downstairs cloakroom. Upstairs there are three impressively sized bedrooms and a spacious family bathroom. The master bedroom also features a built in wardrobe with outward opening doors which give you all the space you need. Gardens to the rear and front with driveway. Have You Got A Property To Sell? - Woodhead Oswestry Sales & Lettings will be happy to offer a free, no-obligation assessment of your home, property or land so we can advise you where it fits into the current property market. As well as having a first-rate understanding of the property markets in Oswestry, borders and surrounding areas, we are Oswestry's chosen representative of the prestigious Guild of Property Professionals which means we can put your property in front of people from all over the UK who are looking to move to the area. Help To Buy - The government Help to Buy scheme is available. Incentive - £500 towards purchasers legal costs available- terms and conditions apply. Fixtures & Fittings - Fixtures and fittings other than those mentioned above to be agreed with the Seller. Local Authority/Planning - Woodhead Oswestry Sales & Lettings Ltd have not checked rights of way, footpaths, covenants, easements, wayleaves, nor existing or proposed planning permissions concerning this property or the surrounding area. Connected Interest - The properties on this development are being built and sold by a relative of an employee at Woodhead Oswestry Sales & Lettings. Hours Of Business - Monday - Friday 9.00am - 5.00pm Saturday 9.00am - 1.00pm Sunday Closed. A 24 hour answer phone service is available.